That’s it. 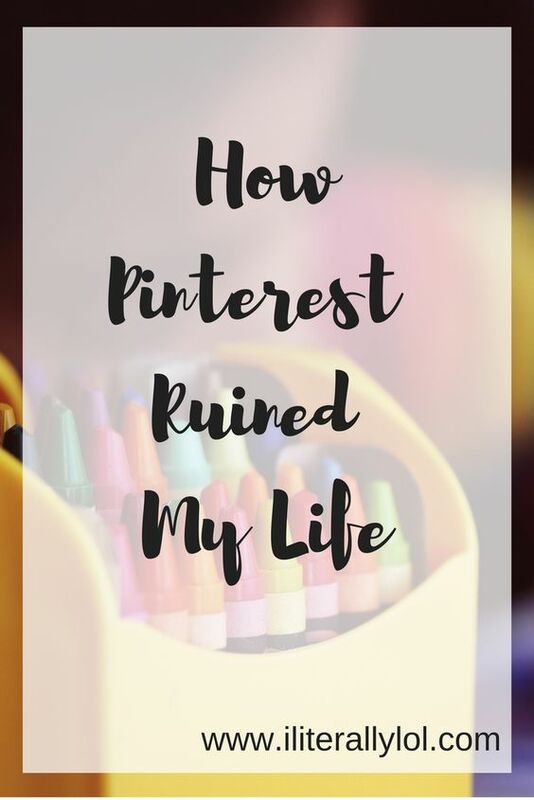 I’m breaking up with Pinterest. In the beginning, it was all new and exciting and filled with hopeful promises of high class 3-course meals using just 4 easy ingredients and tutorials on how to transform my trailer into a mobile mansion with a countryside cottage feel and educational tips that guaranteed my children to be Beethoven-playing prodigies before their first birthdays. Oh yes, Pinterest and I had it going on. Insert hair flip here. So, about that… three kids later and the relationship is looking more like the Brangelina saga than the fairytale fabulousness we once had. Now, Pinterest mocks me, reminding me what a failure I must be if I don’t pack dinosaur-shaped sandwiches and fruit sculpted into hexagons with a side of pate in my six-year-old’s lunch box or if my four-year-old isn’t reading classic novels by now errr yesterday. And remember all those promises Pinterest swore to me?! Well, I’m lucky if I can whip up PB&J most nights and the only countryside feels happenin’ at my trailer are the barefooted ragamuffins digging holes in my backyard and as for the prodigies, well, they know their ABC’s. Pinterest, we are done. I would say, “It’s not you. It’s me,” but no, it IS you. Your nauseatingly, perfectly perfected crafts and recipes have destroyed me. The comparison game is strong and jealousy runs amok. Not to mention the fact that birthday parties can no longer be about simple games and fun but rather are about the carefully hand-crafted themed décor I slaved over for days weeks months before the party with hot glue gun burns to show for it. Pinterest somehow has moms everywhere in an enchantment, preventing us from remembering what life was like back when we were kids… back when we ate sandwiches for lunch, and if you were one of the cool kids, you graced the school cafeteria with a lunchable in hand. Back when birthday parties had cake and presents and…oh wait, no, it was just cake and presents. You know, the good ole days of simplicity and dial-up internet. Oh, sweet nostalgia. For the naturally crafty and creative, Pinterest is heaven, but for people like me who find no joy in cutting out shapes from cardboard and painting numbers on flashcards, Pinterest is simply exhausting. It’s one more thing telling me that I’m not doing enough—that I can’t possibly be a good mom if I don’t pour blood, sweat, and tears into every activity, craft, meal, party… and trust me there has been plenty of blood, sweat, and tears… did I mention tears? Yep, it’s over—my obsession with all things Pinterest. Done. Finished. Over. The end. P.S. If you could pin this post, I’d be eternally grateful. Also, if you need me, I’ll be scoping out Pinterest for P.J. Masks birthday party ideas for my son’s 5th birthday. Oh yes! I really just look up simple recipes these days and support blogger friends on Pinterest. And I’m bringing back simple bdays this summer for my kiddos. I was talking to my hubby last night about it. I said, “it’s us moms that put the pressure on ourselves to have this extravagant party for our kids. Our kids don’t really care about how fancy a decoration is. They’d be happy with balloons, cake and their friends there.” And even though I’m crafty, it’s a lot of work for something that’s 2 hours long. The June Highlights magazine came in the mail 2 days ago and it has a story about the perfect birthday. And it was a handful of kids running through sprinklers and later eating ice cream. Sounds fun to me! Oh yes! Sprinklers make anything fun! And you are amazing with crafts… you keep it simple! Sooo talented, friend! Haha! I still love it! LOL Don’t get me wrong… part of me secretly loves it! I agree 100% (praise hands here)! Pinterest and I have a love hate relationship. Today it was love because I actually found an easy-ish recipe to make at my moms for Mother’s Day breakfast but there have been many – MANY – hate days where its made me want to rip out my hair. Ohhhh Pinterest! It’s so easy to get overwhelmed with! Ugh! But dang if it’s not a love/hate relationship. Also, I literally laughed so loud at the end of the post; the P.S. part! Too good! haha it is quite the love/hate relationship for sure!